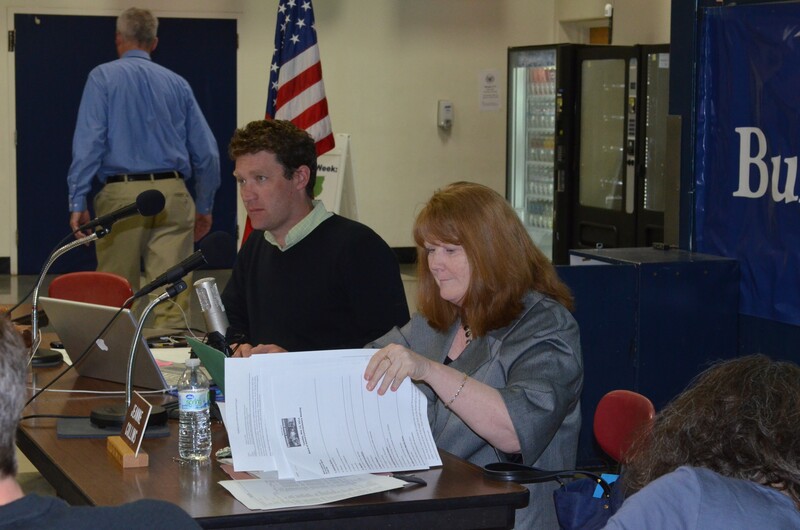 Jeanne Collins at a recent Burlington School Board meeting. UPDATE 3:30 P.M. 5/20/2014 Story was updated to include Jeanne Collins' comments on her job search. Embattled Burlington Superintendent Jeanne Collins agreed last week to leave her job — effective June 30 — but she's already a finalist — the only finalist, in fact — for the open superintendent position in the Rutland Northeast Supervisory Union. The Rutland Herald reported that Rutland Northeast held a community forum Monday night in which Collins fielded questions from residents. Collins' competition for the post, Carl Chambers, withdrew from the running last Friday, after accepting the superintendent position with the Windsor Southeast Supervisory Union, according to the Herald. The search commenced in early April and Collins applied the first week in May, according to Carol Brigham, head of the search committee. Twenty-two people applied, eight of whom were qualified and four of whom were interviewed, she said. The Burlington School Board negotiated a separation and settlement agreement with Collins after an investigation into the district's chronic deficits uncovered problems with the way her administration had been drawing up school budgets for the last several years. Collins, who makes roughly $130,000 a year plus benefits, and whose contract would have run through June 2016, is leaving with $225,000 in severance pay. The board initiated formal discussions, in executive session, about Collins on April 18. The search committee is aware of what happened in Burlington and is researching the situation, Brigham said. "I would like to make a statement about being a finalist for the Superintendent position for Rutland Northeast Supervisory Union. As of June 30th I do not have a job; it was not my choice to be in a position of looking for a job as I wanted to continue to work in Burlington Schools, but that option is no longer available. The School Board approached me to consider resigning if we came to an agreement on my contract and we have reached an agreement. "I am very excited about the possibility of working for the Rutland Northeast Supervisory Union as their Superintendent. I am very interested in this position and I believe I am good fit for their needs as well. I just want to be considered based upon my merits. I am looking forward to moving on. I hope that articles in the press do not adversely affect my getting this position. At this point I will have no further comments." Brigham said the committee will continue to do reference checks and will visit Burlington sites before making a final recommendation to the full board on May 27. The feedback from residents was mixed, according to the Herald story: "Many approved of her leadership skills and involvement within the schools. One Brandon resident said, 'she sticks to her values and never backs down from a difficult situation.' However, many said they felt obligated to approve of her simply because they were presented with no other candidates." At least one question was asked about Collins' role in Burlington's most recent deficit.